When I was in 6th grade, my friends and I started a fan club. I’m not sure what we were fans of. We each signed a fan club membership card, though, and we had at least two meetings in my friend’s garage to leaf through issues of teen fan magazines. Shawn Cassidy and Lief Garrett were on the pages back then, posing in leather jackets and bell-bottoms. I didn’t mind babysitting on Friday nights in high school as long as I could put the kids to bed and watch Remington Steele. I was a big fan of Pierce Brosnan’s dreamy blue eyes. The summer I got my driver’s license was the summer of Top Gun. We cruised down the highway in my aunt’s silver Cadillac, windows down and “Highway to the Danger Zone” blaring on the radio. I was a huge fan, not of Tom Cruise, but of Val Kilmer. I loved it when his character, Iceman, snaps his teeth at Maverick and calls him dangerous. Nowadays, I’m not a big fan of many actors, although I do admit that David Tennant was an admirable Dr. Who. Rather than hot men, I seem to be more a fan of other things. I’m a fan of my morning cup of coffee. I love Kaffe Fassett fabric designs. 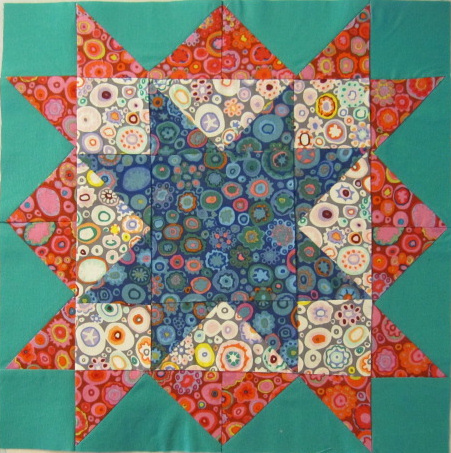 Here’s a quilt block I just finished using “Paperweight” fabrics. I’m a fan of blogging and my readers, comments and Constant Comment tea. I’m a fan of morning walks and sunsets on the beach. I’m a fan of real chocolate and cheeseburgers. 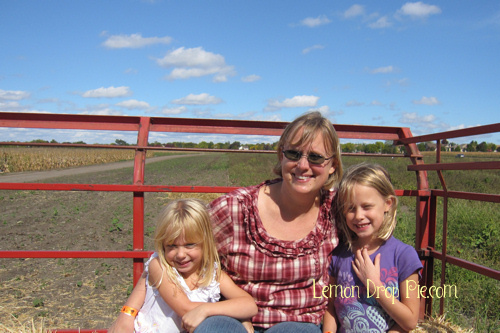 I’m a fan of hayrides under blue skies and spending time with my daughters. I’m my husband’s biggest fan. Those are all wonderful things to be a fan of! The Osmonds! I still consider myself a groupie because I still go to see them whenever possible. Also a fan of fall, camping, country music and home improvement tv shows. Stopping by from SITS Saturday Sharefest! Ooohh, Shawn Cassidy! Loved him! I had the most enormous crush on Ralph Macchio when I was a kid. "Rather than hot men…" I guess there's only room for one hot man in your life these days! I guess you're right! 😉 See Wednesday's post. Great post, Ginny Marie! I'm a fan of lazy Saturday mornings, The Hubster's cooking, little black dresses, cleaning the house in my jammies to loud music, finding something new just for me in a Scripture I've read over and over. I'm a fan of you! I don't want to make you jealous, but I have met and worked with Val Kilmer. And David Tennant was TOTALLY the best Doctor. I now have Jude hooked on Doctor Who. The big season finale is this weekend. Get OUT!! Yeah, sure you didn't mean to make me jealous! 😉 Tell me you stole some of Val's trash! Oh, I'm fan of chocolate and caramel, too! 😀 And pizza. There's no such thing as too much pizza!